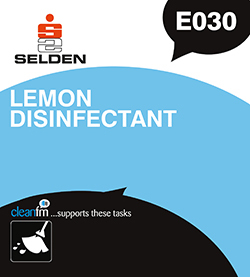 Kills smells and malodours, leaves fresh lemon fragrance. Conforms to BS 6471 QAP 60. Effective against Escherichia coli. As a general disinfectant for floors, walls, drains, schools, nursing homes, offices and factories etc. N.B. Do not use in food preparation or serving areas. Disinfecting: prepare a standard solution of 1 part to 50 parts water for all general cleaning. Heavily soiled articles should be rinsed clean before disinfection. Disinfectant solutions should always be freshly prepared. Use neat for drains, toilets, waste pipes, refuse bins etc. For washing hard surfaces, walls, floors, work tops, etc. Dilute 1 part to 100 parts water. As an air purifier and spray, dilute 1 part to 60 parts water. Composition A powerful disinfectant incorporating a modern cationic bactericide.